The Committee has met regularly from December 2016 with invitations distributed by ASX. The meeting schedule and documents are provided below. Summary of MyStandards comments and ASX responses on draft usage guidelines - 'as-is' (updated 6 February 2018). 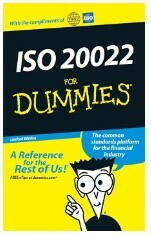 Request your electronic copy of the booklet "ISO 20022 for Dummies" here. You will be asked for name, company and contact information. Please enter "ASX CHESS Replacement on ISO 20022" for the question about the ISO 20022 initiative you are interested in. The booklet will appear in a browser. You can download a PDF copy by clicking on the PDF icon in the bottom right hand corner of the screen. Details on the SWIFT-led industry program to ensure a cost effective and seamless adoption of ISO 20022 by Market Infrastructures and their communities - available here. Information Paper on ISO 20022 Implementation Strategies published July 2017, including a case study on the Australian Securities Exchange CHESS Replacement project. ISO 20022 web site Information about ISO 20022, business domains, catalogue of messages, external code sets and news here. Market Identifier codes (MIC) Codes for exchanges and market identification (MIC) issued per ISO 10383. The latest list is published here.